Shanghai is on a peninsula with the Yangtze River (Chang Jiang) to the north and Hangzhou Bay to the south. Its about 100 km from downtown Shanghai to the end of the peninsula on the new A2 Expressway (a toll road). 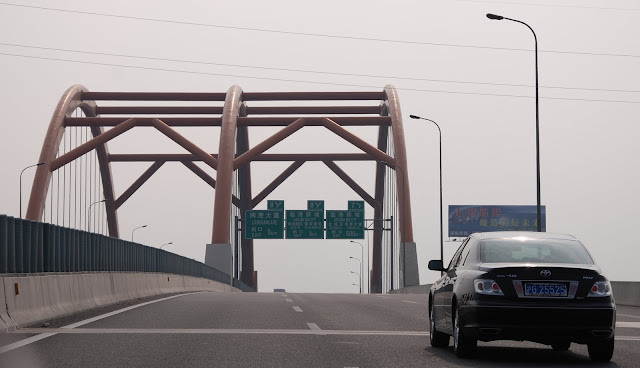 The expressway carries traffic onto the Donghai Bridge that goes 32.5 km into the Bay (to the Yang Shan Islands). If you continue another 600 km to the northeast (across the East China Sea) you'll reach South Korea and Japan. About 8 km before the end of the A2 Expressway (and the beginning of the Donghai Bridge) is a tubular steel, tied arch bridge. It crosses over a canal but I don't know if this bridge was the most economical choice or maybe it was chosen because people in China really like arch bridges. Shanghai, China's Bridges: A2 Expressway Bridge at Longgang by Mark Yashinsky is licensed under a Creative Commons Attribution-NonCommercial-ShareAlike 3.0 United States License.